My family and I are lucky enough to be able to call Naples, Florida our home from home. It's where we take our yearly holiday, and we wouldn't change it for the world. A few years ago, we ventured out a little further than we had previously and discovered a beautiful shop located in Fifth Avenue. Amongst all the quirky little boutiques and fancy restaurants, there's a little beach shop called The Blue Mussel. The Blue Mussel is a beautiful trove full of the most wondrous trinkets, everything from seashells, to sea glass bracelets, to shark teeth, to the most intricate pieces of jewellery! It's mermaid heaven. There is no other way to put it. It's the perfect place to get gifts for family, friends and most importantly, yourself! I have always had a fascination with the ocean, since I was a little girl, I would read about mermaids, watch mermaid movies, pretend I was a mermaid, I wanted nothing more than to grow fins! The whole concept of the mysterious underwater world has always been a huge interest of mine. Being on the beach is the most relaxing thing for me, it has such simple beauty. 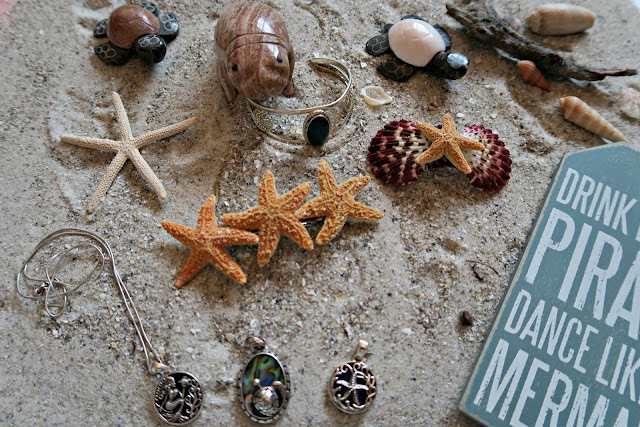 And The Blue Mussel just happens to fit in, almost ridiculously perfectly with my love of the ocean and all things beachy! My mum, sister and I go there every year, numerous amounts of time, and I literally can't remember a time where we left empty handed. Even my 11 year old brother loves visiting! Everything I bring back from The Blue Mussel, has a really special place in my heart. This year, my mum treated me to a beautiful mermaid pendant. I had been eyeing it up the entire vacation, but the amount of money I had in US dollars wouldn't cover it, as I'd previously splashed on clothes (In hind sight this was NOT a good idea - I thought standing in The Blue Mussel). So one day, we were in there, gazing into the glass cabinets filled with these wondrous treasures, and she said she would treat me to it, so that I had a permanent reminder of our magical holidays in Naples. As you can imagine, this necklace has incredible amounts of sentimental value, and every time I see my reflection in the mirror, or fiddle with my necklace out of nerves, I'm reminded of my most favourite place, and the people I share it with. These are two other pendants we have purchased from the Blue Mussel, their intricate beachy designs are unlike any pieces of jewellery I have seen before. The year before last, this little shop opened our eyes to these gorgeous marble turtles, they come in a range of sizes, we ended up coming home with about 20 odd between the women in my family (3 of us!) but they are the most adorable things you have ever seen. Also, a donation goes towards a foundation, to help protect sea turtles, so obviously that justifies that right! We have also had two giant titles shipped home. We have so many people comment on them, they truly are beautiful. I can't forget about the staff! They are all super friendly too! When you go in as regularly as we do, you're bound to start to becoming familiar with the cashiers! I cannot describe this store as anything other than perfect. It is my absolute favourite shop, I have EVER been too, and it would take one hell of a shop to top it. If you are ever in the area, I highly recommend popping in for a visit, you will not be disappointed I assure you! Or if not, head on over to The Blue Mussel website and take a look for yourself at the beautiful trinkets they offer! Follow The Blue Mussel on social media to keep tabs on any new products coming in, sales and more!! They are on Facebook and Instagram! P.S. The Blue Mussel, have two very cute staff members, if you manage to pop in on the right day, you may be lucky enough to catch a glimpse!